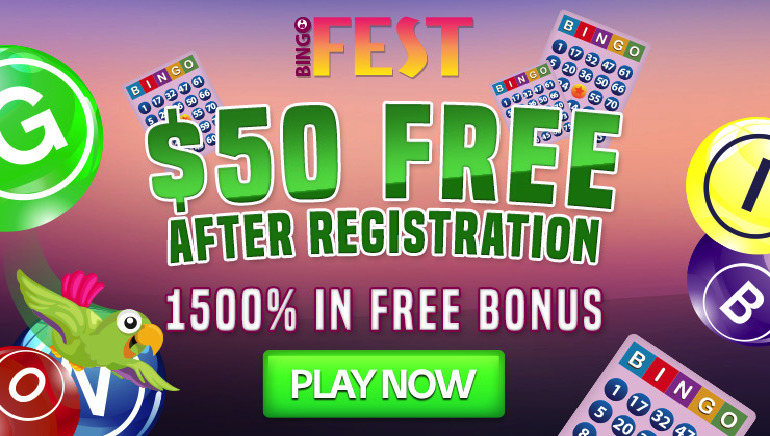 Bingo Fest is a festival of bingo games all on a fun, exciting platform, which Canadian Players can access from their smartphone, tablet or home computer. Totally optimized for play while on-the-go, Bingo Fest combines innovative iGaming technology with excellent deals and top notch customer service. New players and longtime members are all treated like VIP's and are rewarded in different ways simply for their loyalty. 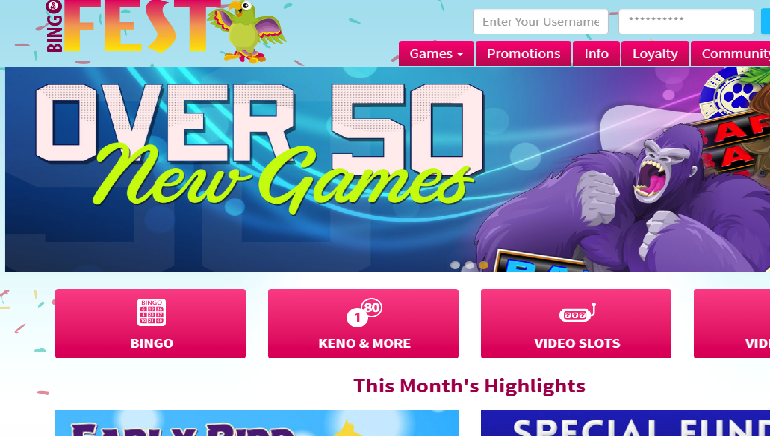 For the last 20 years, Vista Gaming has been at the forefront of online bingo gaming. They are the name behind a number of the best iGaming sites and Bingo Fest is definitely one of them. Vista has dozens of bingo rooms to choose from and constantly creates new games to ensure they stay at the top. Bingo Fest provides multiple bingo rooms, each with its own theme and varying jackpot. Each of the bingo rooms feature a progressive jackpot that is regularly worth thousands of dollars. Games include Diamond Bingo, Classic Bingo, Pack and Line, Bingo Free Roll, a Tourney Room and more. The games are excellent to play on mobile devices and the HD graphics look even better on a smaller screen. The business of promotional offers is a dynamic one for Bingo Fest. The site maintains a number of player bonuses for new members, longtime players and everyone in between. The promotional offers change regularly and players are recommended to check the promotions section to see all the new deals and discounts. Secure and fast payment options can be the difference between a popular and an unpopular site. Luckily Bingo Fest provides the best online banking methods available. Players can make safe deposits using Credit Cards like Visa and MasterCard, Neteller, Skrill Moneybookers, eco Payz, UPayCard, Paper Check, Bank Transfer and more. 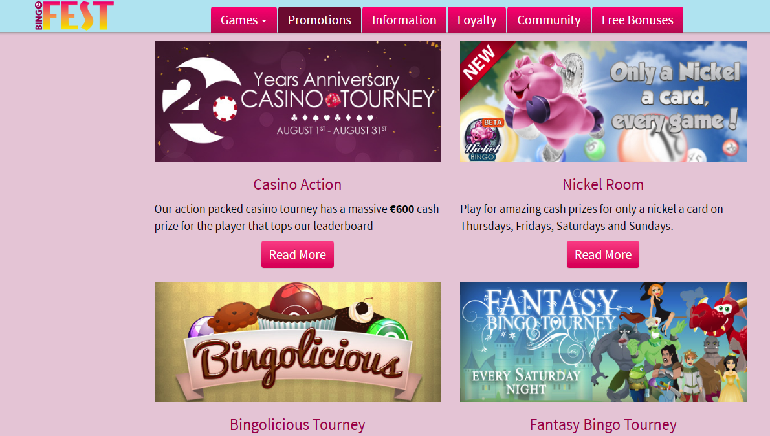 These methods are used by the best iGaming sites in the industry and it is great to see that Bingo Fest does too. Bingo Fest believes that excellent customer service is one of its core values. This is why the site offers 24/7 customer care via live chat or email. Players can get in touch with a professional customer service agent to ask a question, fix an issue, make a comment or anything else related to the platform. Agents are all friendly, willing to help and will guide you through anything in their power.